Family Coasteering - The ultimate family holiday activity in Newquay! Leap straight into action with our wet and wild coasteering family activity holidays, the ideal adventure for your family in Newquay, Cornwall. Join us and see a side to our beautiful craggy cliffs you may never have known existed, with smugglers’ caves and incredible marine life. You’ll also get to tackle natural rapids and fun cliff jumps into the sea! The activity can be pitched to family’s of all ages. Why choose our family coasteers? 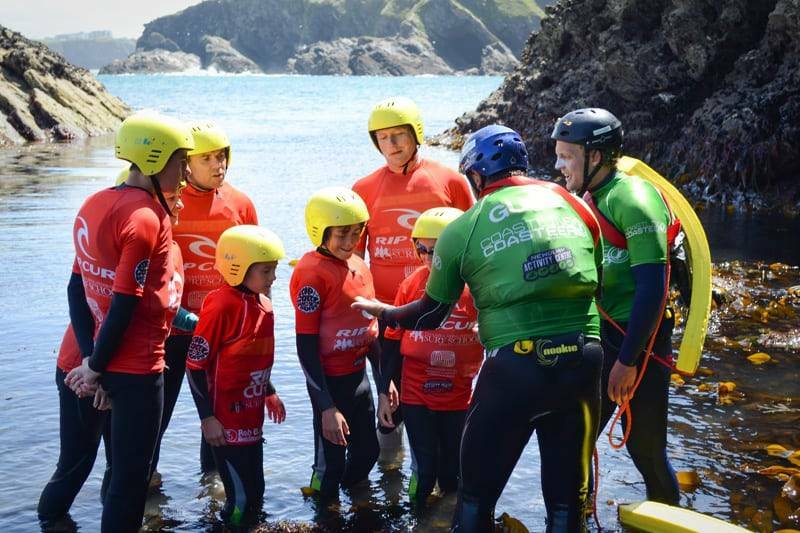 Coasteering is the perfect family activity for getting kids active outdoors and learning about our coastlines. Push boundaries in a supportive environment under the expert guidance of our professional instructors, whilst exploring our risk assessed and kid-friendly coasteer routes. Your family can choose the intensity of the experience. You’ll get kitted out in a wetsuit, buoyancy aid and helmet in our on-site changing rooms with storage for all your belongings, before negotiating a route recommended by one of the most highly qualified coasteering leaders in Cornwall. For family activity holidays in Newquay our low tide coasteering route is highly popular as you can access every aspect of the coastline including the old smugglers caves. With you own instructors, our private family coasteers can be tailored to you and your family’s abilities, focussing on particular aspects of out coastline’s exhilarating environment. Whether it’s adrenaline fuelled jumps and rapid riding you’re after or an eco-focussed approach with caves and rock pools, we have the perfect coasteer for you. For younger children we can also embed coastal safety messages to up-skill the youngsters in ocean safety. However you choose to adventure with us during your family activity holiday, you’re sure to experience an incredible outdoor environment with guaranteed safety and exhilarating fun. Our reviews on Tripadvisor for Coastering at the NAC rank us as number one for Cornwall activities and we’re proud golden winners of the Cornish Tourism awards. Our Family Coasteers are unique to Newquay activity Centre and will be an adventure to remember! Industry leading, fully qualified adventure coasteer instructors. All experienced in leading family groups of all ages.